AUBURN - Ruth Vachon, 90, of Lewiston, passed away at the Androscoggin Hospice in Auburn, on Feb. 5, 2019. AUBURN – Ruth Vachon, 90, of Lewiston, passed away at the Androscoggin Hospice in Auburn, on Feb. 5, 2019. She was born in Lewiston on June 2, 1928, the oldest daughter of Emile and Corinne Boutin Vachon. She was a member of St. Peter’s Church in Lewiston, attended Holy Family Elementary School and graduated from Lewiston High School, class of 1946. She attended Bliss Business School and worked as head bookkeeper at Geiger Brothers for 40 years. 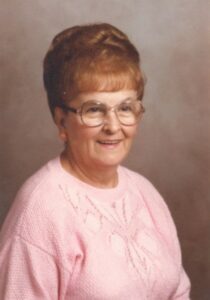 She was well known in the community for her talent for dancing and enjoyed ceramics and sewing as hobbies. She is survived by a sister, Jeannine Vachon of Lewiston, a brother, Real Vachon of Arnold, Md. ; many nephews and nieces; great-nephews and great-nieces. She was pre-deceased by her parents; her sister, Lorraine C. Baril, a brother, Robert Vachon; and her companion, Raymond J. Forgues. Friends and family are invited to share their memories and offer their condolences by attending the visitation hours 4 to 7 p.m. on Sunday, February 10, at Fortin’s Funeral Home, in Lewiston. A Mass of Christian Burial will be celebrated on Monday, February 11, at 1 p.m. at the Basilica of Saint Peter’s and Paul. A committal service will follow at St. Peter’s Cemetery, Lewiston. A luncheon will be provided at Fortin/ Lewiston, following services. Please visit www.thefortingrouplewison.com to share condolences.